Viking Books for Young Readers, 9781101997239, 256pp. Pablo Cartaya has always been a hopeless romantic. In middle school he secretly loved reading Shakespeare’s sonnets (don’t tell anyone), and he once spent his allowance on roses for a girl he liked. He also wrote her eight poems. Bad ones. He’s been writing ever since. Pablo has worked in Cuban restaurants and the entertainment industry, and he graduated with an MFA from Vermont College of Fine Arts. All of these experiences have helped him write stories that reflect his family, culture, and love of words. Pablo lives in Miami with his wife and two kids, surrounded by tías, tíos, cousins, and people who he calls cousins (but aren’t really his cousins). Learn more about Pablo at pablocartaya.com. "At turns funny, beautiful, and heartbreaking... engrossing." "A vibrant debut novel about family, friendship, and community." "Pablo Cartaya's sensational debut is a love letter to boyhood, poetry, and family. Quite simply, this is the book I've been waiting for." 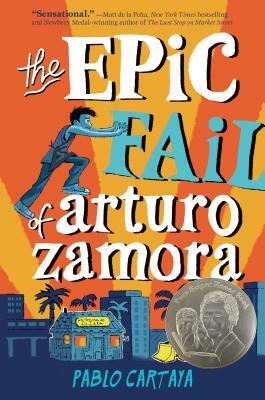 "This story of hope will make you laugh, cry, sigh, and cheer for brave Arturo and his whole cool familia. Along the way, you'll end up hungry for Cuban food, ravenous for poetry, and determined to stand up to bullies who try to destroy communities. ¡Bravo!"